I started work recently on a series inspired by a book I received for Christmas focusing upon the manuscripts and imagery of Alchemy and Mysticism. 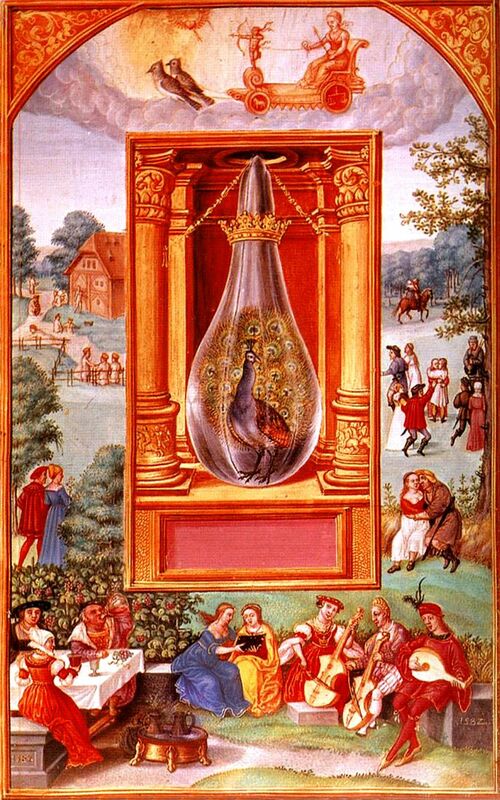 I've always found Alchemy a fascinating, mysterious and intriguing topic, so it was certainly about time I delved a little deeper and found out a little more about this lost art form. What instantly struck me about the book was the beautiful illustrations depicting a whole manner of weird and wonderful things, which today seem quite alien and strange. Thumbing through the book one series of illustrations in particular which struck me were from the 'Splendor Solis'. This 16th century treatise is largely famed for its stunning artwork and its easy to see why. With a central alchemic bottle surrounded by a lavish gilded border, all set in another even more elaborate border come scene the artworks stand out as truly beautiful, bizarre creations. They sparked within me the idea of displaying creatures in a bottle of their own, like a specimen trapped for all to see in their own sealed world. I began pondering on the concept in more depth. Who was this alchemist who had created these creatures? Why had he created them? Was he not the equivalent of what some people considered to be a divine being capable of creation? As usual I got a little swept up in the concept, envisaging some ancient wizened figure mixing all sorts of strange substances in his studio to create the whole world of weird and wonderful creatures, but with the twist that these creatures are not fantastical, but real. Hinting that the Alchemist, a wise man of our world, possessing its ancient secrets, is what some would call a god, the creator, a supreme being. (Its little wonder I struggle to sleep at night with things like this going round in my head constantly!). With my concept firmly in place I started to consider what animals I'd like to feature. Naturally I picked some of my favourites, some of the more bizarre or striking creatures of our natural world and some which I felt represented a different group of animals and an ecosystem (often British). I decided to adorn the border with flora and fauna of the animals natural habitat, enveloping it in its own little world.